If you missed my KBIS Day 1 recap check it out here! Recently I was asked by Design Hounds to join them at KBIS - The Kitchen and Bath Industry Show. This show is a great way for designers, architects, builders and showrooms to see what is new with brands they already use and also be introduced to new brands and products. I thought it would be fun to do a little recap of some brands I saw there and what was new. You can also check out my highlighted stories on my instagram. Design Hounds did sponsor my trip to the show, but all opinions are my own. Thank you Design Hounds! I’m going to bounce around between brands I saw as well as some trends which I think are relevant across brands! Caesarstone is a produce I use in my projects all the time. They have the best quartz colors and finishes! When I saw they invited us to their Beyond the Surface Showhouse, I was thrilled! The party was buzzing, so it was a little hard to get great photos of the home, but you can check out more of it here on their website. It was great to see so many of their surfaces featured in the home. As a bonus, I got to meet Sophie Dow - former editor of House Beautiful and all around really great person! We had a really informative presentation from Mr. Steam, a leader in the steam shower industry. While I love specifying steam showers in homes, I didn’t realize how many health and wellness benefits from using steam on a regular basis! It helps relieve stress, it may relieve some allergy symptoms, promotes sleep, improves circulation and so much more. I was blown away but how it can really benefit a home owner when used and installed properly. KBIS offered a really unique show called Design Bites, hosted by Kelly Ellis. Each brand was given three minutes to discuss their product or something new in their line. Given that the entire KBIS show is so HUGE, it would be impossible to see everything, this was a great way to see some new products I might not have seen otherwise. One product that I was really excited to see during Design Bites was the LG Styler which freshens clothes with the gentle power of steam. I’m typically quite incredulous of introducing new technologies in the home until they have a proven track record, but this seems like something that really could be an added benefit in a master closet suite or a larger laundry room. While it doesn’t replace the need for dry cleaning, it can help freshen up clothes and reduce wrinkles. Thompson Traders is a family owned and run company, specializing in environmentally responsible copper sinks. They have a huge array of finishes, but I especially loved their CUSTOM metal hoods! I know many designers struggle with where to source unique metal hoods and Thompson Traders is a great source for that. They also have a really unique new black finish which they showcased on a powder room sink. Thank you Design Hounds for hosting this fabulous tour of KBIS and introducing me to many new unique brands and products! Lamps Plus has some great lighting and also offer a variety of brands. They sponsored one of my light fixtures on my most recent one room challenge. They showed a great selection of basic outdoor LED lighting at some great price points. A variety of metals like brass, chrome, matte black and polished nickel have had their moment in the last few years in design. It was exciting to see brands like Kohler and Vol showcase some new finishes and the breadth of their entire line. With plumbing fixutures, I tend to stick with timeless classics, but it always depends on the situation and space. These are some of my favorites that I saw from the show - modern fixtures with an interesting finish. Thermador had a fabulous booth and some impressive appliances. For clients with a need for a second dishwasher, it was fantastic to see their new glass care center dishwasher which is specifically for washing glasses. This would also be a great option for a butler’s pantry. They are also launching a new blue signature metallic knob for their ranges which would look so chic in the right space. Typically I work with all local custom cabinet makers on my projects. It was great to be introduced to Wellborn Cabinetry which was a very busy booth at the KBIS show. They have a variety of custom and semi custom options, and I loved how they showed integrated lighting in all of their drawers and behind all of the doors. I also saw a lot of walnut drawers and walnut drawer inserts, as featured here from Wellborn! That’s all to show you from day 1 of KBIS (but there were sooo many more!) but come back tomorrow and I’ll feature some brands I saw on day 2! Here are some of my favorite kids rooms right now. Mixing patterns is the perfect way to add personalized interest in kids spaces. I’d love to design a double kids room one day with two twin headboards. How fun! This post uses affiliate links. All opinions are my own. One Room Challenge Week Six - Final Room Reveal! It’s reveal day for the Six Week One Room Challenge and I can’t wait to show you the finished space!!! Getting it all done in only six weeks was so rewarding and now I have a gorgeous guest room totally finished! 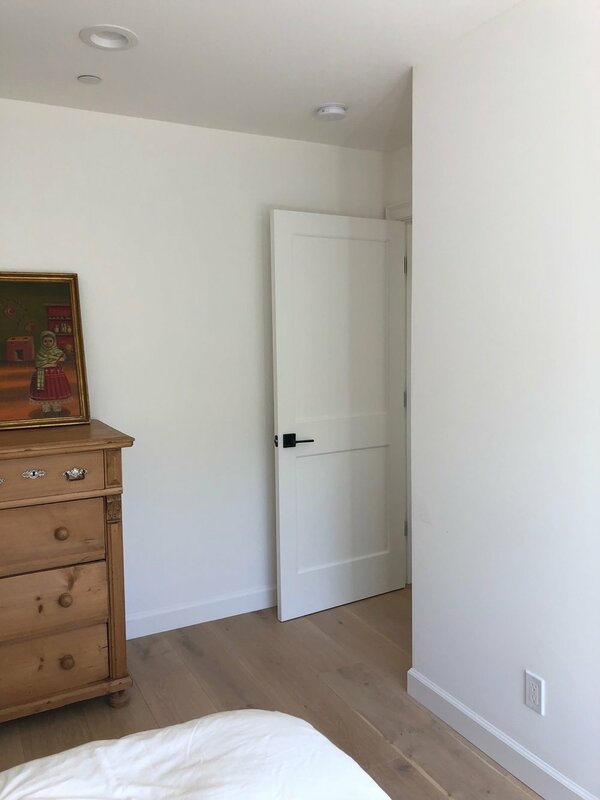 It’s now always easy to get a room done so quickly, but that is the fun part is actually pushing through some of the issues to accomplish a finished room! I’m also excited to share some of the sources I use with you today since I don’t always reveal sources I use for my client’s spaces. Did you miss the six week process? If so, please go check out the other weeks so you can see the transformation! Week One, Week Two, Week Three, Week Four, Week Five. I do want to let you know that I received some sponsored product for this room, brands of which are listed at the bottom. I would only use and recommend products in my designs which I love. The pair of Arianna Belle gold yellow velvet pillows make the room and pull everything together. 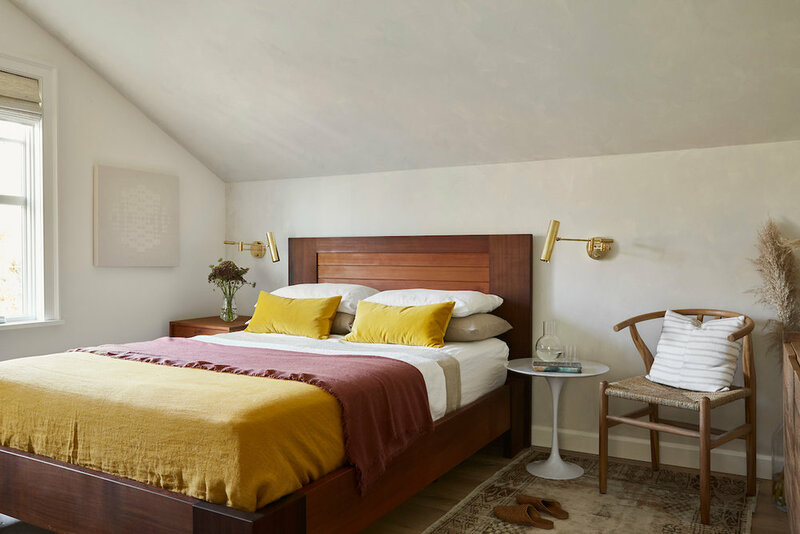 As you know from my previous posts, I wanted to layer Ochres, yellows and warm tones in this guest room makeover. These velvet pillows are gorgeously well made and the velvet makes the room feel a little more luxe. You can get these in a variety of sizes, these particular ones are 12x20. I used my existing cedar bed and side table which my husband had made about ten years ago but layered it with new furniture and accessories to make a warm and relaxed space. The linen bedding is from Cultiver, which I have used several times before and love. I specified their white fitted sheet, white and natural linen pillows, a linen throw, and white duvet cover. 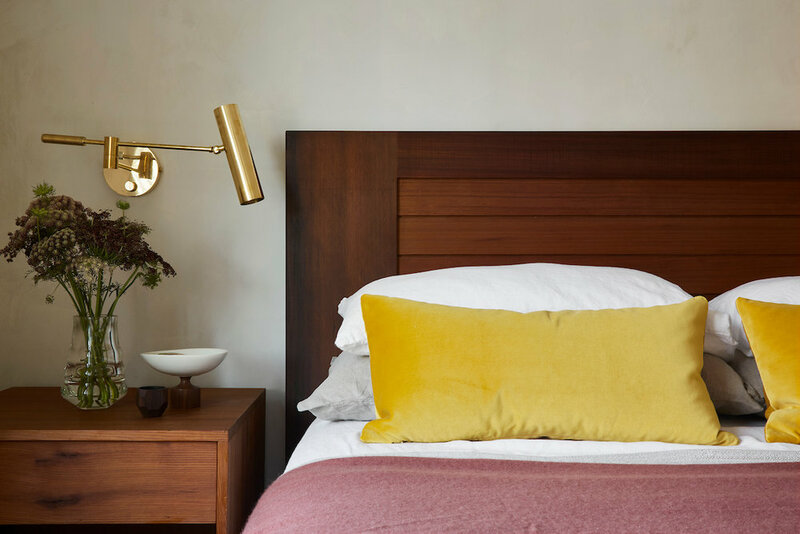 In colder months I will definitely add a duvet insert but for now in the early fall months of California, I love layering with an ochre linen blanket and cashmere burgundy blanket. I paired it all with a vintage runner. There are a lot of modern elements in the space, so the vintage runner makes it feel a little more relaxed. I met the artist of this embroidered piece, Alice Wiese, a few years ago at the West Coast Craft Fair. She makes these hand embroidered pieces using white thread. This particular piece adds so much dimension to this little corner! If you have been following my instagram stories, you know I lovingly lime washed two walls in this room by hand. I used Sydney Harbour Lime Wash in Mountain Ash. The result is so soft and serene - I really can’t wait to Lime Wash a room myself or specify Lime Wash again soon. It has such a warm quality to it and now that its sealed is wipeable like an eggshell paint would be. Hayneedle generously sent me this Marble Tulip Side Table and Wishbone chair for my Guest Room One Room Challenge makeover. 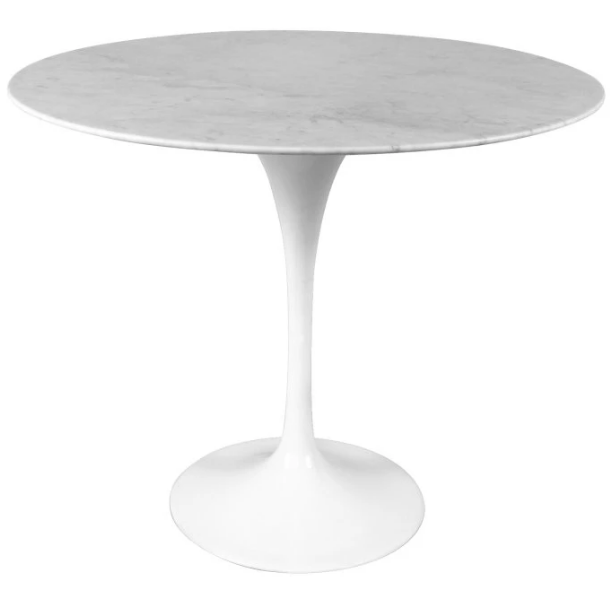 The table top is real marble and its the perfect little petite modern addition to the room. I love how it opened up the room completely and adding something round into this room softens the look as well. I paired it with a glass carafe and a pair of handmade brass sconces from Etsy. The oak wishbone side chair is surprisingly comfortable! It’s a classic I can see living with for a long time - just one of those pieces that can be put in an office, a living room, bedroom, dining room - a very versatile chair. I fell in love with the Baja Sand stripe fabric from S. Harris from their line with Fragments Identity. I had my workroom make my pillow and offset the center seam to create a little interest and dimension! I didn’t use a self welt because I wanted it to tie back to the Arianna Belle gold yellow pillows with the same construction. The stripe color in the fabric matches the walls beautifully. I love stripe pillows - they just always seem to work and add a little bit of interest without being too loud! 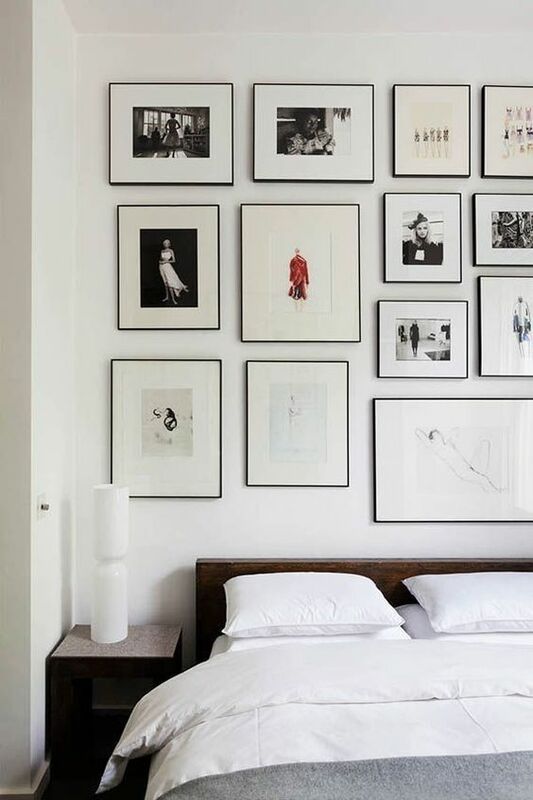 One of the things I’m MOST excited about in my new Guest Room is the art wall across from the bed! I used three five foot Minted art shelves and an array of Minted art pieces, vintage artwork, and I even did a little DIY painting at the top using left over Lime Wash. I used all thin black metal and brass frames from Minted, some with matts and some without. I wanted a California coastal vibe and a neutral color palette - I’m seriously smitten with the result! The Minted art shelves are great because I can update the art display as I collect new pieces or my taste changes. They came with a bracket for easy hanging and even a level so you know they are straight. I was worried we wouldn’t get these up in time for the photoshoot but they really took less than ten minutes to hang! Styling actually came together quite quickly, I like to have a variety of heights on each shelf, and a mixed in some different shapes and natural elements just for fun. 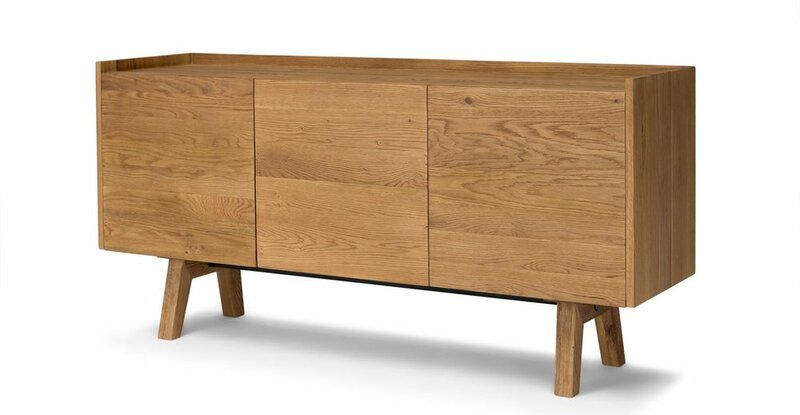 This Article Madera sideboard! Do you remember the “before” dresser? Well isn’t this just a breath of fresh air!? 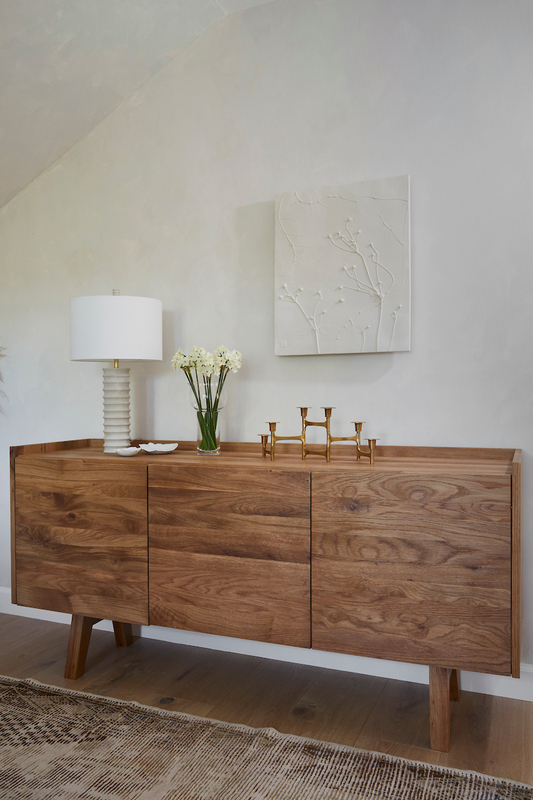 This article sideboard is the perfect modern addition to the space. I usually put sideboards in living rooms and dining rooms, but I wanted something really low and slender for this space. It is made in white oak, has soft close hinges and now stores all my extra bedding for all the bedrooms in the house! It provides ample storage for this closet-less room. The art piece above the dresser is by Ron Nicole - and is made of plaster! When my first piece arrived damaged in shipping, she graciously rushed a replacement which was hung as my photoshoot was starting! It is even more beautiful in person - she gathers wild flowers and presses them into plaster and makes these by hand. If you don’t already follow her on instagram I highly suggest it - there is so much love, craftsmanship, and creativity that goes into her work. The piece pairs perfectly with the Lime Wash walls and looks soft and warm, especially in the evening light. I’ve wanted one of her pieces for a while and this was a great excuse to finish the space. Lamps Plus sent me this awesome sandstone lamp for the dresser. It has a naturally soft hand feel and it visually looks so stunning with the Lime Wash walls - especially at night! Lamps like this one are like jewelry for the home and really complete the look of the space. 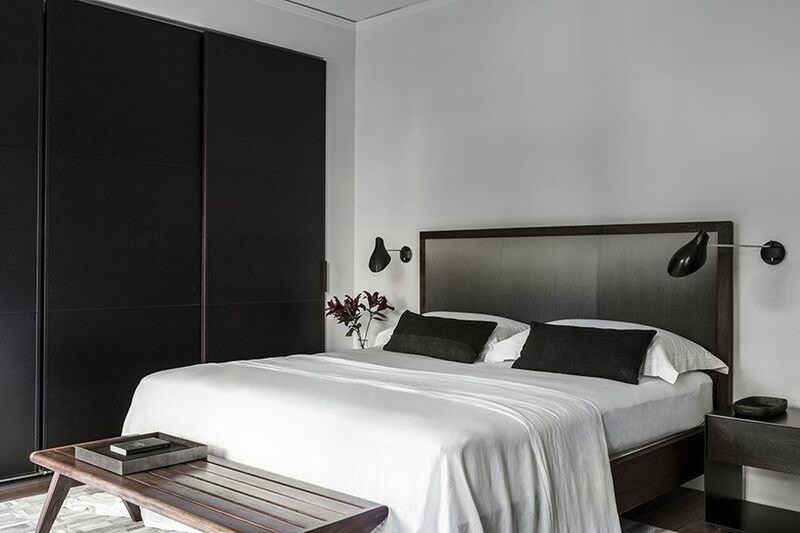 Its nice to have some different lighting options (in the case of this bedroom, overhead recessed lights, sconces, and this table lamp on the dresser. The layered effect of lighting is flattering and functional. If you are feeling overwhelmed by the scale of lighting, Lamps Plus has some handy videos and guides on their website to help you find the perfect piece. The beautiful porcelain dishes are by ceramic artist Yoon Young Hur sourced from The Interior. Thank you for following along on my One Room Challenge journey! Comment below and let me know your favorite part of the room! I love to hear what you think! Thank you especially to Linda, the creator of the One Room Challenge for this opportunity to be a featured designer this season! All photos by Vivian Johnson Photography. To see my previous One Room Challenge from Spring 2018 - check it out here! I can’t believe we are already into the Week 5 of the One Room Challenge! So much has happened this week, some good, some bad, and mostly above all else, I am moving forward! Because getting it all done is the name of the game with this six week challenge One Room Challenge! If you missed the other weeks and you would like to see the progress you can check them out here! Week 1, Week 2, Week 3, Week 4. After I finished lime washing the walls myself, it was time to get to work getting all the furniture back into the room so I could start styling. My husband stayed up late with me to help me get this done. I was also super excited to get my mostly Minted art wall up across from the bed. This was such a boring wall before, so I had decided this was going to be a major moment with some artwork. I had been coveting the look of ART SHELVES for a while and was surprised that Minted offered these. 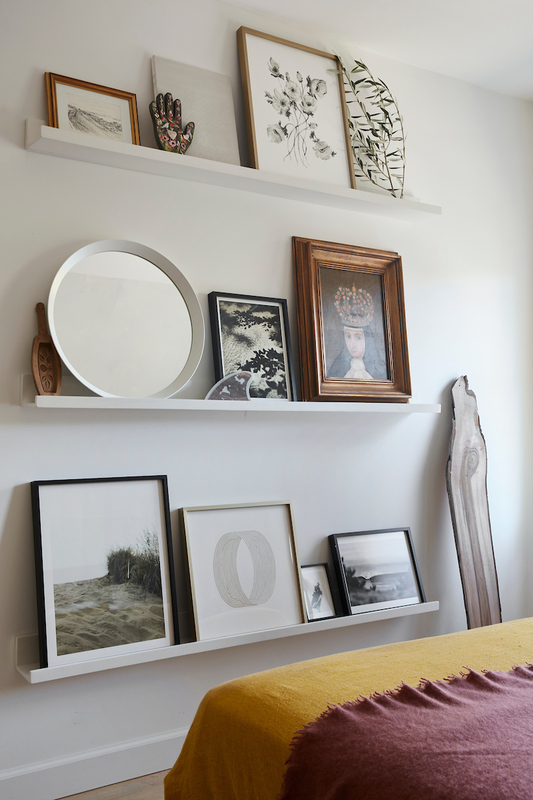 Once I picked out 3 of the five foot white shelves, I got to work selecting some Minted pieces to sit along side some vintage artwork I wanted to showcase. I used all the thin black metal frames or the thin brass metal frames. I went with mostly black and white pieces with a hint of neutral and pieces which felt meaningful to me for this space. I cannot believe how fun it is to style these shelves and I love that I can switch things up so easily as my collection changes or grows. I’m so happy with the way this turned out. I can’t wait to show you more, but for now, here is a sneak peak I revealed on my instagram stories earlier this week! I also picked up a super cute pillow from my workroom. I used this stripe S.Harris fabric and had it offset in the center seam to create some interest. I’ll be sure to reveal this on my final reveal next week but I have to keep somethings a surprise - right?! Unfortunately I had some major disappointment this week as well. I ordered an amazingly beautiful original art piece to sit over the dresser, which arrived in PIECES (thanks to the shipping company). The artist had loaned it to me while my personal piece was being finalized. So I’m generally just heartbroken for mostly for the artist, for the art, and the entire situation. I can’t even bring myself to properly write about it, but I promise to reveal more when I have time to put my thoughts into words. My photoshoot was rescheduled until Thursday so I have a day to figure out a replacement. Part of my job as an interior designer is to deal with issues that arise so I am sure we will find a solution. And after all, it wouldn’t be the One Room Challenge without the “Challenge” part, right? Getting a room designed, ordered, installed and ready for a photoshoot in less than six weeks is no joke. Now I need to get to work styling my space. Follow along on my instagram stories if you’d like a behind the scenes look! Now go check out these other amazingly talented designers completing their rooms! The BIG main accomplishment this week was LIME WASHING THE WALLS! I am not your average DIY blogger or designer, but once in a while I like to get my hands dirty and make a design happen, especially if its for my beloved One Room Challenge. I have had a LOT of interest on instagram this week about Lime wash, so I thought I would give you a little bit more information here on my blog this week. First of all, let’s talk about what Lime wash is… Remodelista said it best “An ancient house staple dating back to Roman times, lime wash is made from limestone that’s been crushed, burned, and mixed with water to make a lime putty. The putty is aged and then thinned with water and colored with natural pigments. 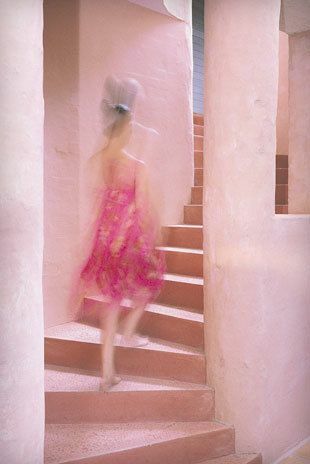 Lime wash creates surfaces that are mottled and matte with a chalky texture something like suede. It lends a depth and luminosity to flat walls.” Lime wash is traditionally mixed on site, but some companies are selling Lime wash pre-mixed so its super easy for the end user to apply and use. It is also completely green, ZERO VOC, and has hypoallergenic properties! Once it dries, it has a soft chalky look which looks warm and romantic. The Lime itself is white, so Limewash generally looks more pronounced on darker colors. It also looks beautiful in an off white, but the Lime itself won’t show up as a contrast to the pigments as much. I selected Mountain Ash from Sydney Harbour Paint Company, they carry a line from Australia called Porter’s Paints. 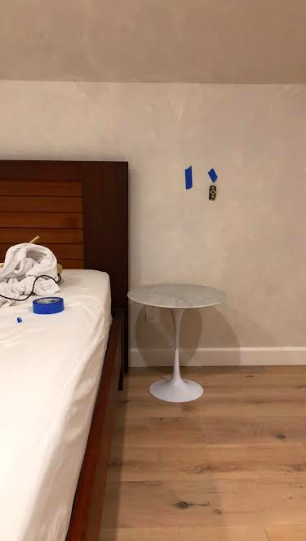 My painter wasn’t that into this small project, and I wasn’t that into shelling out hundreds of dollars to have a wall painted, so I did a little research to do it myself. The beauty of limewash is in the imperfection, so I knew any little mistake would only enhance the look. Sydney Harbor Paint company’s full color palette is available in their Interno Limewash and I have been dying to use it on a project. I watched a few you tube videos, and then I got to work. If you are interested, here are the main steps below, but I suggest you also look on your paint manufacturer’s website and talk to a professional if you are interested. Even though I feel like an expert, after doing it this one time! 2 - Use the Limeproof Undercoat sealer so the Lime has something to adhere to. You can use a roller for this and cut in the edges. The undercoat sealer definitely has an odor. Let dry six hours. 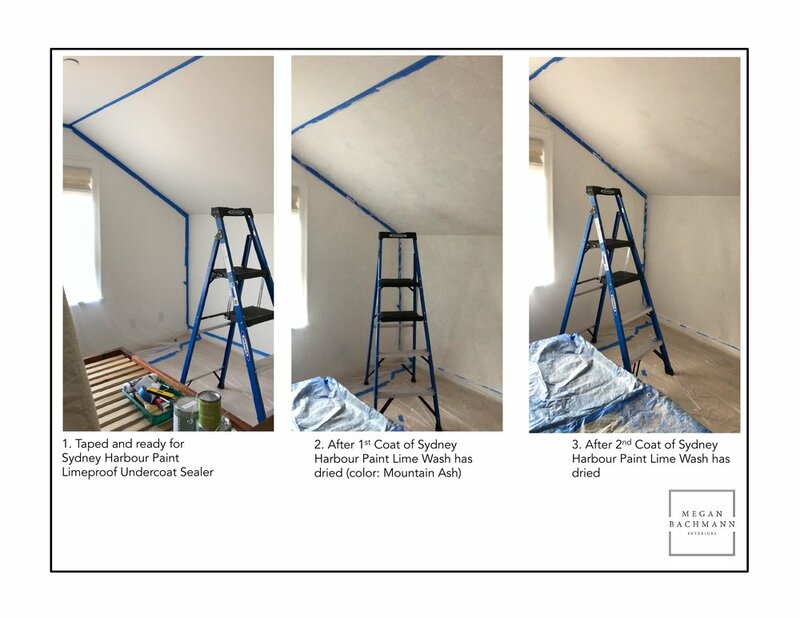 3 - Use Sydney Harbor Interno Limewash in a criss cross brush stroke pattern using a block brush. Keep a ‘wet edge’ and don’t stop until you finish the wall! Cut in the corners as you go. The first coat looks super scary but let it dry and see what happens! 4 - Do the second coat, the same as above! Let dry and enjoy! I love the result of the first wall so much, I decided to do a SECOND wall at the last minute. This process goes surprisingly fast and the results are SO beautiful! I feel like the room has so much more soft character now, just what I was looking for. Now I’m scrambling to get my room styled and complete before the photoshoot next week!!! I have the entire process listed on my instagram stories, check it out if you are interested! And, I’ve been keeping track of all of my ideas for this project on my PINTEREST BOARD, if you would like to follow along. Now go check out the progress on these fabulous Featured Designers! I can’t wait to see their progress this week, including some others also doing Limewash! I feel like Week THREE is when things start to get really serious. The six week deadline is approaching FAST and everyone who is participating is scrambling to get it done on-time. I knew when I got back from Spain that I needed to HUSTLE this week to pull it all together and place final orders. Have you been following the progress on my One Room Challenge? If not take a trip to Week One and Week Two! And I’ve been revealing a lot on instagram stories as well. As a reminder - here is my Mood Board for the space…. Before I left on my trip to Spain, I ordered a pair of custom sconces from this Etsy shop. These sconces are going to add a wow factor and also tie into the color palette in the room. Here was my inspiration for bedside sconces…. Additionally, I thought it would be nice to have some ambient lighting on the cabinet. When I found this one on *Lamps Plus, I knew it would be perfect! I love that the sandstone will add a natural texture to the space. Lamps Plus has quite a few how-to videos and buying guides as well! One of the major things I’m nervous about securing is the right rug for the space. The one I was originally going to get is no longer available, so I am searching high and low for the right not too vintage but just vintage enough rug to complete the room. The right rug is going to MAKE this room. I have found lots of rugs which are way over my budget but I’m going to have to make a decision soon in time for the photo shoot! One of the things I love about this challenge is it forces me to make decisions and get it done so I can move on and enjoy! Have you been following these talented One Room Challenge designers? If not go check out their progress! I love to see how everyone is approaching their projects differently! Best of luck to everyone who is participating! *Lamps Plus is a generous sponsor of the One Room Challenge. All opinions are my own. This week of the One Room Challenge went by quickly! I’m currently on a vacation (in SPAIN! ), but I made some major decisions on some of the larger pieces of furniture to keep everything moving forward. 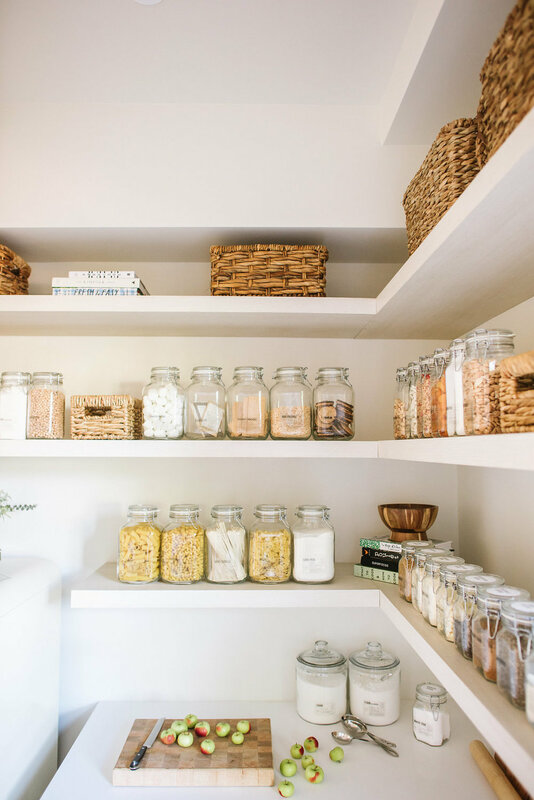 I love the One Room Challenge for how it pushes to make decisions for my own home. If you missed it last week, check out the first week of the One Room Challenge. Before I dive into some of the details, I am going to introduce you to my final mood board for the space so you can see why some of these decisions make sense! I haven’t landed on everything yet but this mood board will give you the sense for the direction I’m going. I create these mood boards for each space I design and they are always a work in progress. Truth be told I actually made 5+ versions of this mood board before I landed on one that felt right. Design is a PROCESS and while it may look like I just put this together in ten minutes, it actually took quite some time to land on the final one I’m happy with! I’m going to introduce you to each part of the room every week, so stay tuned for more details! It’s still a work in progress and it’s fun to update as I make decisions. The first thing I knew I had to decide on was the accent wall. It took me a good amount of soul searching to decide what to do with it. I LOVE wallpaper and had some contenders on the short list for this space. But I have used wallpaper as an accent already in several rooms in my home, and this room just didn’t feel like it was asking for wallpaper! 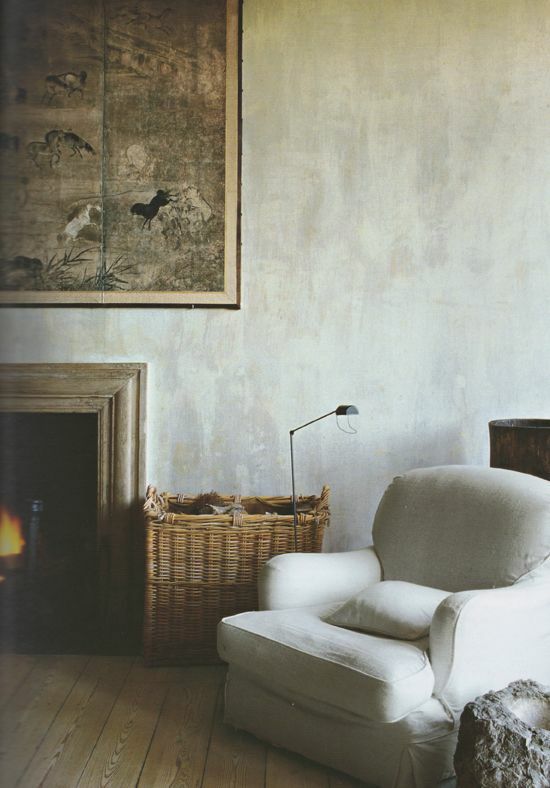 One thing I have been wanting to try is either a Plaster wall or a Lime Wash wall. These techniques bring so much character into a space. 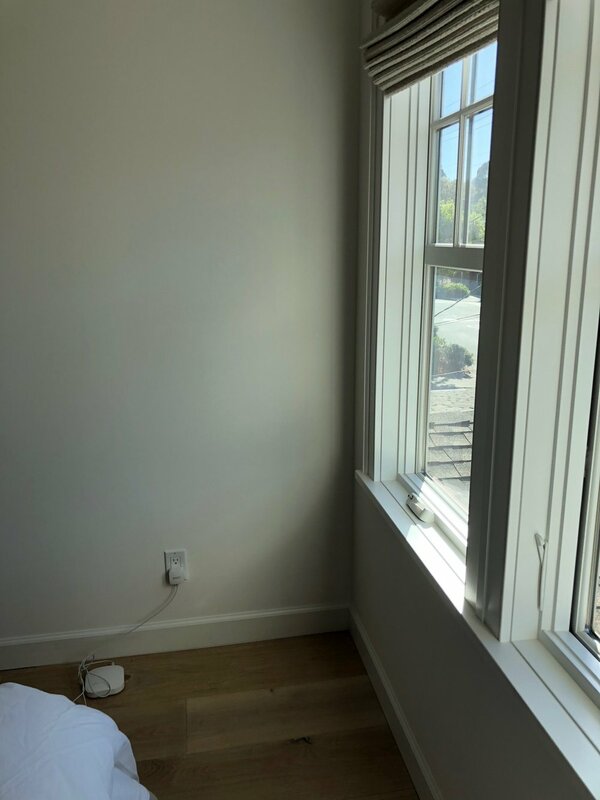 The four white walls of my guest room need SOMETHING and the main wall behind the bed would be perfect for a Lime Wash. I need to get the accent color just right (some of these inspiration photos are a little drab), and if I do I think the OCHRE color I am planning on using in accessories is going to sing! 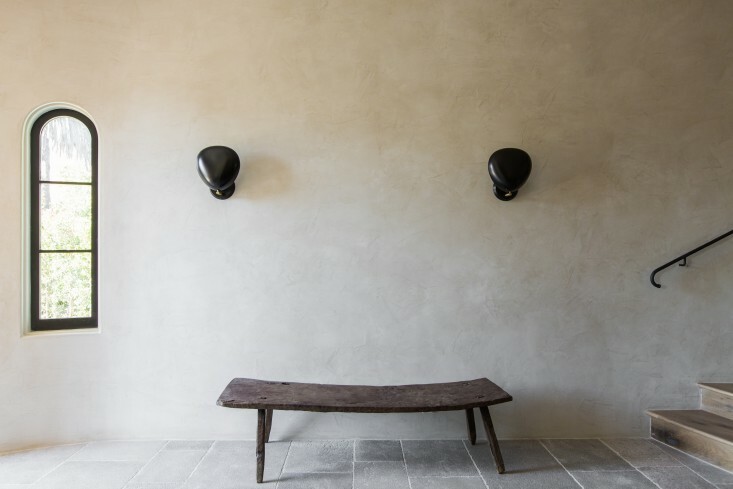 Here are some examples of Lime Wash and Plaster walls… and remodelista has some great articles about them if you are interested in learning more. I’ll be sharing a lot more about Lime Wash when I get back from my vacation. The next thing I needed to decide on was the larger dresser which would replace the vintage one. I searched high and low for the right one. I needed something that I could get in a hurry (this is a six week challenge after all!). I wanted clean lines and light wood. When I found the Madera Oak Sideboard at *Article, I knew it would be perfect! It’s long and low, and can act as a perfect grounding piece for art and accessories. I really can’t wait for this to arrive and can’t wait to style it in the room. I was also surprised to see Article carries so many STYLING accessories! I knew they had furniture but they also have lighting, rugs, throws, and decorative items. I also picked up this Mollo throw as an accent piece - I thought I could style it on a side chair as a counterpoint to the ochre color I’m going to use. The other main pieces of furniture I decided on are from Hayneedle. I really wanted to place a marble top tulip side table next to my existing wood bed to make it feel light and pretty and I also wanted a modern side chair. A chair is always great to have, even in a small guest room, so you can sit to put your shoes on (or you know, throw all of your half dirty clothes on after you try on 3 outfits). Hayneedle has an amazing selection of mid century modern designs that fit in the budget, a lot of which are available quite quickly! I selected a marble top tulip table and wishbone side chair. I have a LOT MORE TO DO and a lot more items to select, but I feel like I’m off to a good start with some of the main foundation pieces for this space! Thanks for following along and I can’t wait to give you some more updates next week!!!! Also, the other Featured Designers have some incredible makeovers happening… check them out! *Article and Hayneedle are generous sponsors of the One Room Challenge, all opinions are my own. GUESS WHAT! We are finalists in the Remodelista 2018 Design Awards! To say I'm thrilled would be an understatement. Remodelista is one of my favorite go-to's for inspiration and I'm so lucky to even be considered for these awards. And not just for one award category - for TWO!!! You can vote EVERYDAY in each category so vote away until August 4th! Thanks so much and I love you! Here's a sneak peak at these spaces and you can see more of these two spaces on their website. These are from a recent project I completed for a wonderful family - you can see more of this project all over my instagram and I'll be putting it up on my website soon too. One Room Challenge Week 6 - The Reveal! I'm so excited to share Heidi's Room which I completed in only 6 weeks as part of the One Room Challenge! It was so fun to imagine and get her room finished in a short amount of time. And its very appropriate that she also turned 18 months old on Tuesday! So the nursery I never had the chance to finish for her when she was a baby is finally done! I found Jesy Almaguer on Instagram earlier this year and she was just starting her new shop - Marleine in the Valley. 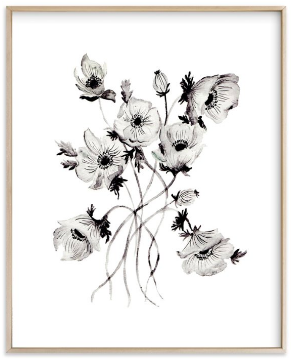 I was specifically looking for some pressed flower art and love how it turned out blown up and framed in a white oak minimal frame. Jesy presses her own flowers and then photographs it too! I had it printed at a local printer and then framed by my framer around the corner, using acrylic glass for safety. It coordinates beautifully with the pressed flower sheets from the Etsy Shop Babiease. 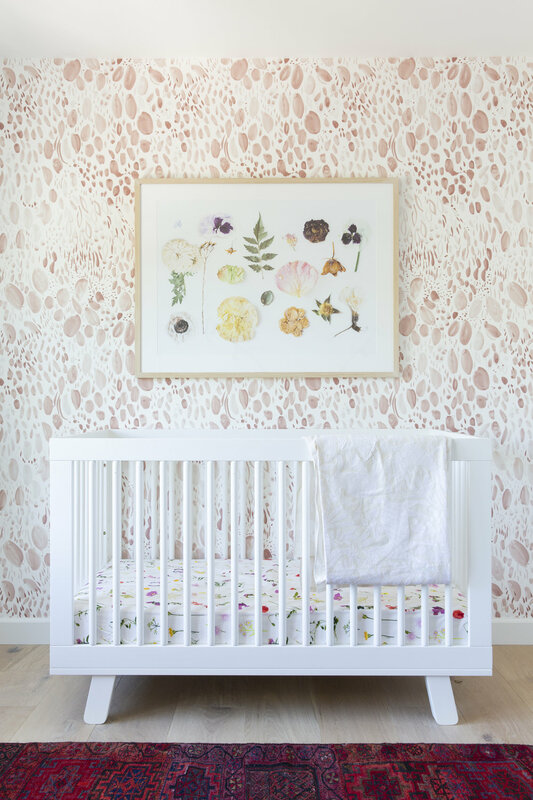 This Rebecca Atwood Blooms wallpaper looks even prettier in person and is the perfect shade of subtle pink. The rug, is a vintage camel back rug my sister found in Turkey a few years back! I love that it has a home here now. My little ladybug loves her room, especially the little playhouse which I wallpapered with leftover wallpaper. She loves being able to reach for her favorite books whenever she wants to. Jane Denton sent me this LOVELY piece of art which works perfectly with the colors in the space. It is hand embroidered and adds so much personality and texture into the space. 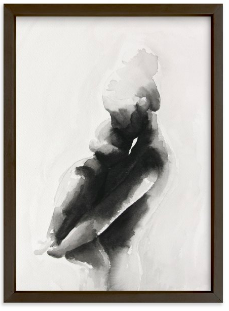 Its also a piece of art I feel that can grow with my daughter as her room changes over time, yet feels so perfect for her space right now too. 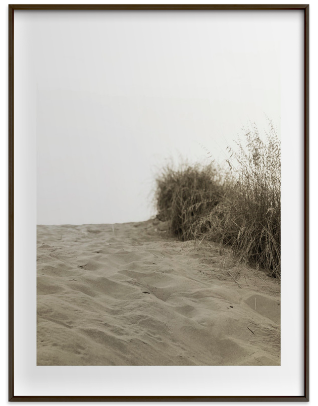 Jane Denton is located in New Zealand, and my framer here in California also happens to be from New Zealand - I just love all these connections! Heidi loves her closet too - just kidding! It's more for me, although she does love to take everything out of her drawers. I didn't set out to makeover or style Heidi's closet when I started, but since I had some extra wallpaper, I decided at the last minute it would be adorable to organize and style it for the One Room Challenge. Now it makes me smile every time we reach in there for a new outfit each day. Thank you all for following along this six week design journey! You can look back here at : Week 1, Week 2, Week 3, Week 4, and Week 5. Thank you to Vivian Johnson Photography for the beautiful photos. Week Four - Here we are ! Most of the items for this One Room Challenge have either been ordered or picked up, but I'm still anxiously waiting on a few things like the new crib sheets, some marigold yellow accessories, and the floor cushion inserts. I have the photoshoot scheduled for next Wednesday so technically I need it all done before then! 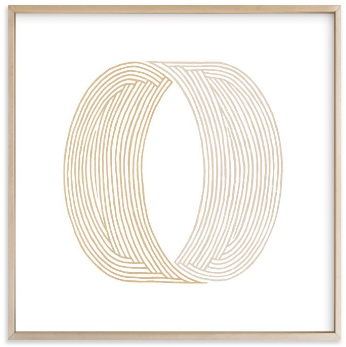 The gorgeous Rebecca Atwood wallpaper went up earlier this week and my goodness its beautiful! I also decided at the last minute to wallpaper the back of her closet and it turned out so cute. I did a big shopping haul at Ikea to get a book stand, doll house, and some other accessories. I just love Ikea, its my secret happy place ;-) I don't love putting ikea pieces together, but thankfully I have a really handy assistant for that. I also dropped off two AH-MAZING art pieces off at the framer, just in time for pick up before the photoshoot. I'll show you more of these at the final reveal, we have to keep some surprises, right?! I have some DIY projects I want to do this weekend if I have time, but we'll see!